A Bolivian communications satellite is launched from the Xichang Satellite Launch Center(XSLC), southwest China's Sichuan Province, Dec. 21, 2013. 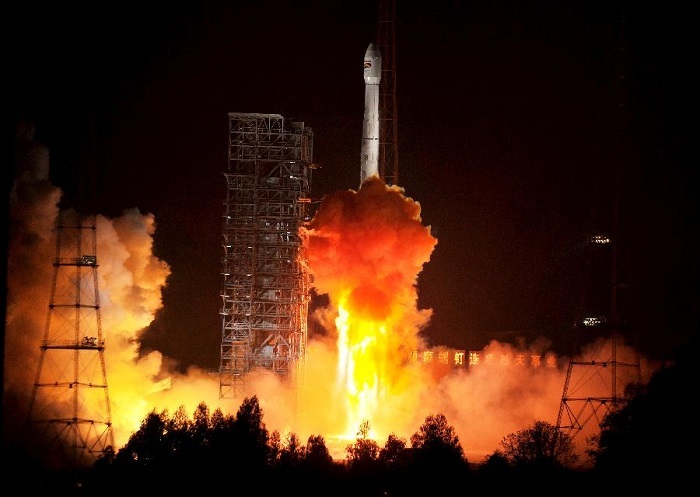 China successfully sent a Bolivian communications satellite into orbit with its Long March-3B carrier rocket at 0:42 a.m.(Beijing Time) Saturday. XICHANG, Sichuan, China successfully sent a Bolivian communications satellite into orbit with its Long March-3B carrier rocket from southwest Xichang Satellite Launch Center at 0:42 a.m (Beijing Time) Saturday. Bolivian President Juan Evo Morales Ayma was present, the first time a foreign head of state has witnessed a satellite launch in China. The satellite was produced by China Aerospace Science and Technology Corporation (CASC) with a designed longevity of 15 years. It is Bolivia's first communications satellite. The satellite is named Tupac Katari in homage to an 18th century indigenous hero who fought Bolivia's Spanish colonizers. Chinese President Xi Jinping sent a message of congratulations to President Morales, saying the successful development and launch of the satellite represents the latest achievements and level of cooperation between China and Bolivia in the field of science and technology. 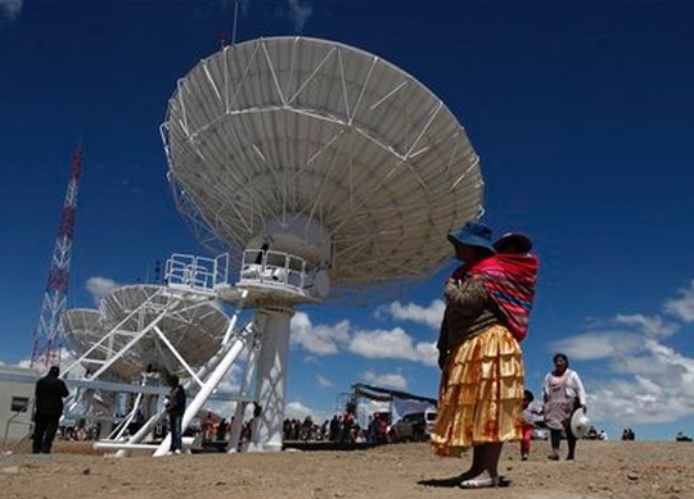 "The satellite will play an important role for Bolivia to improve its broadcasting, education and medical services. It will make important contributions to promote cooperation between China and Latin American countries," Xi said. Bilateral ties have been progressing smoothly while pragmatic cooperation in all areas are making steady headway since China and Bolivia established diplomatic ties 28 years ago, Xi said. Xi said China hopes for more space collaboration with Bolivia, which will promote mutual beneficial cooperation and friendly relations, bringing benefits to the people of both countries. 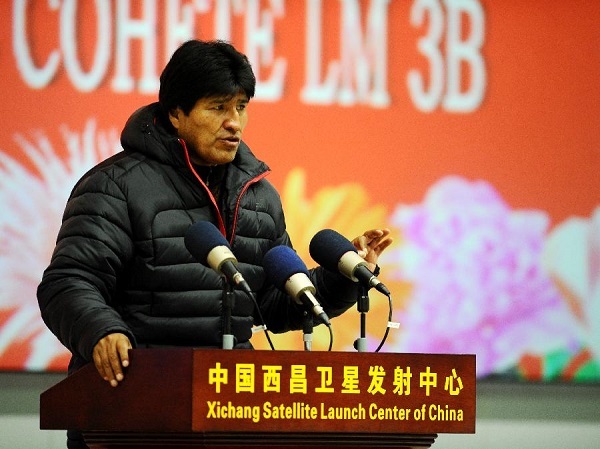 Bolivian President Juan Evo Morales Ayma delivers a speech after the successful launch of a Bolivian communications satellite at the Xichang Satellite Launch Center (XSLC), southwest China's Sichuan Province, Dec. 21, 2013. China successfully sent a Bolivian communications satellite into orbit with its Long March-3B carrier rocket at 0:42 a.m.(Beijing Time) Saturday. In a speech made after the launch, President Morales thanked President Xi for his congratulations and expressed gratitude towards the Chinese government, scientists and the people. He hopes that China and Bolivia will take the opportunity of the successful launch to deepen cooperation in all areas and bring bilateral ties to a higher level. The satellite agreement was signed between the Bolivian Space Agency (ABE) and the Great Wall Industry Corporation of China, a subsidiary of CASC, in December 2010. It is the fifth Chinese communications satellite for international users and the second in-orbit delivery for a Latin American customer. China launched a telecom satellite for Venezuela in 2008. The successful launch will bring Bolivia into an age of digital economy and make its people more connected, said Ivan Zambrana, head of the ABE. "We wish to launch a remote sensing satellite in 2017 and China is one of our best alternatives," he added. The first Bolivian satellite, Tupac Katari, is almost complete, with only some final testing remaining before its launch, which the Government has set for 20 December 2013. The executive general director of the Bolivian Space Agency (ABE), Iván Zambrana, announced details of the project development, saying: "We only need some small things to be done before November and the satellite will be 100% finished." However, a month ago Bolivian minister Vladimir Sánchez said that the project was ready. The satellite is being built in China and the project is progressing almost to schedule. A group of Bolivian engineers will travel to China, from where the satellite will be launched. They're expected to arrive on 12 August to learn about controlling the system. The Tupac Katari, which will take Internet, TV and mobile communications throughout Bolivia, especially rural areas, will take off in the Jiuquan space centre, in northwest China. The project also includes the construction of two control stations, one in La Paz and the other in the eastern city of Santa Cruz de la Sierra.